Figure 1: Map showing the Puuc region and the area under study by BRAP, including Kiuic. Figure 2: A Terminal Classic (A.D. 800-1000) vaulted residence atop Stairway to Heaven (the chultun discussed in the text was located directly in front of it). Photo by George Bey. 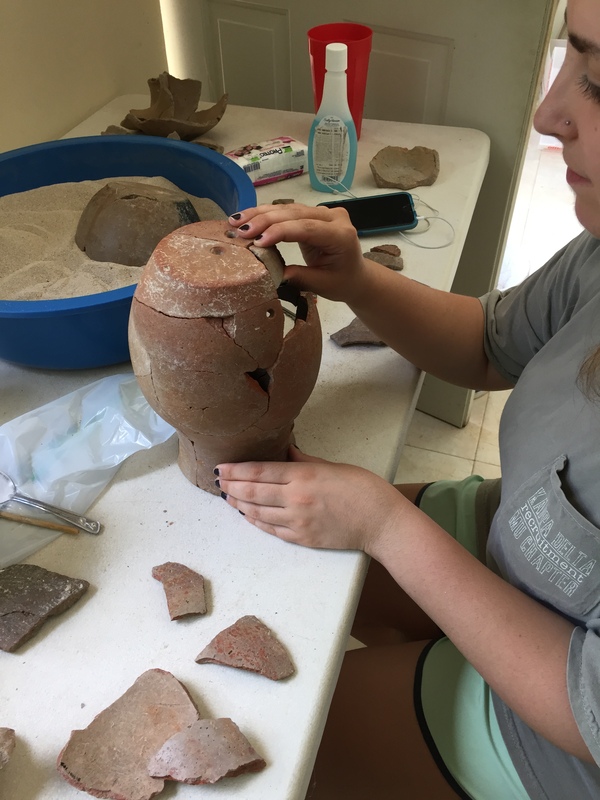 Figure 3: Millsaps student Lauren Voelker put finishing touches on a complete vessel recovered from the chultun at EAC. Photo by George Bey. During the 9th and early 10th centuries an unrivaled era of prosperity and growth spread throughout the Puuc region of the northern Yucatan peninsula. Maya communities expanded in population and scale of monumental construction and the famous site of Uxmal rose to power rivaling the Maya centers of the south and the great northern center of Chichen Itza. New elite hilltop sites were constructed at the edge of a number of Puuc centers, from which the residents could oversee large tracts of agricultural land and managed forests, likely the primary source of wealth in the region. 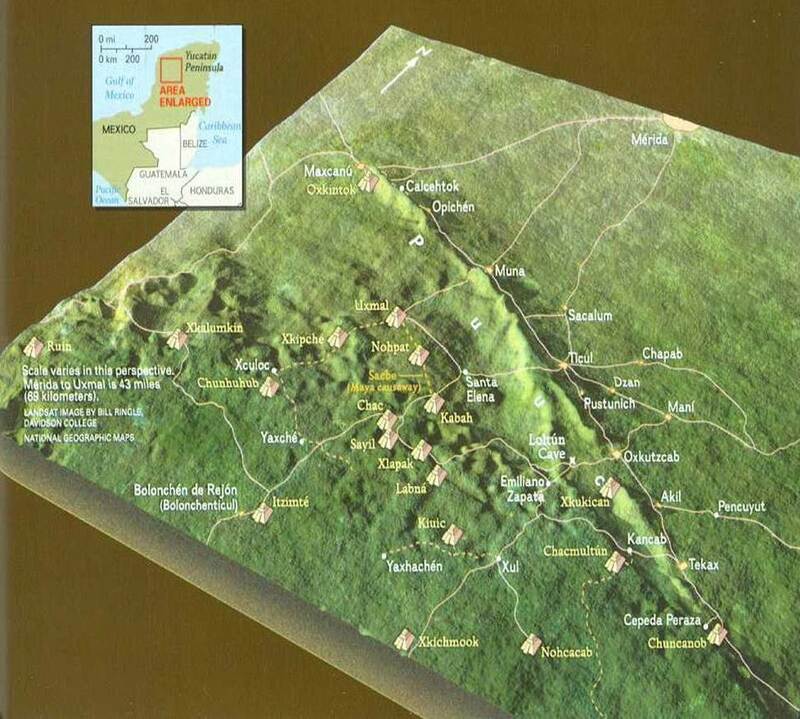 One of these hilltop centers, located at the edge of the Maya site of Kiuic in the southern Puuc (known as the Bolonchen region), has been the focus of intensive archaeological exploration since 2008, as part of the Bolonchen Regional Archaeological Project (BRAP)(Figure 1). Directed by Dr. Tomas Gallareta Negron, Dr. William Ringle and myself, BRAP is a large and multi-dimensional archaeological project that began in 1999 and has run continuously since. Incorporating survey, mapping, remote sensing, computer modeling, excavation and a wide range of analytical techniques, the overarching goal of the project is to explore the history of Maya culture in the Puuc region from the earliest occupations around 900 B.C. until the present. This of course includes the development of social complexity in the Puuc as well as the failure of Maya society at the end of the Terminal Classic Period (A.D. 950-1050) when the region was largely abandoned. The area has still not recovered to anywhere near the level of population that it sustained in the Terminal Classic period. 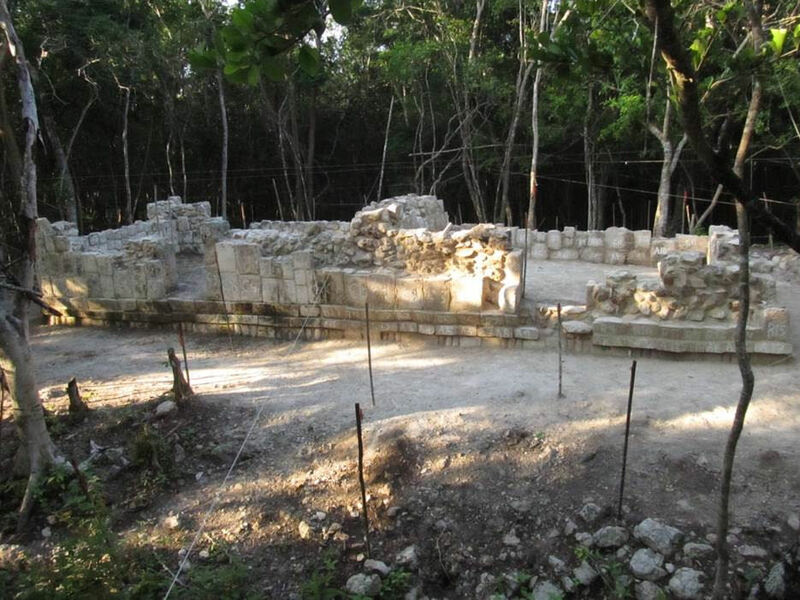 Our efforts at the hilltop site of Stairway to Heaven (Escalera al Cielo) have provided important information both on the lifeways of these small but important social groups and on the process of abandonment of the Puuc region (Figure 2). The inhabitants of Stairway to Heaven constructed both a lovely vaulted “palace” which served as the ceremonial and civic heart of this tiny community, as well as a residential area composed of four smaller multi-roomed vaulted buildings and a plethora of out buildings which were used for a variety of activities such as storage, food preparation, and stone working. We believe this site functioned as a type of plantation, controlling an area of extensive agro-forestry production that surrounded the hilltop group as well as a non-elite labor force which worked under the supervision of the elites living at Stairway to Heaven. We know so much about the lives of the people at Stairway because they left very abruptly, abandoning the community with the plan of returning. You can learn more about this in the National Geographic documentary, Quest for the Lost Maya, available online at http://video.pbs.org/program/quest-lost-maya/. Last summer we discovered something new and potentially exciting about the people of Stairway and the abandonment of their homes in the 10th or early 11th century. The excavation of a chultun or water cistern built directly in front of the most elaborate of the vaulted residential buildings revealed a unique assemblage of ancient artifacts. Typically these water cisterns are found empty or with some basic garbage that fell into them, but this chultun turned out to be filled with hundreds of large pieces of broken pottery, as well as a distribution of other artifacts that raised the possibility that it was used in some type of ceremony or ritual. This idea was further strengthened when a complete human femur was discovered in the middle of the chultun with half of a finely ground stone palette next to it. Footage of the pottery discovery can be viewed below. Was this the site of a final ceremony performed at Stairway to Heaven at the time of its abandonment, or perhaps the location of a ritual offering made after the site was already abandoned? Or could it just be a rich collection of garbage and a stray bone? This summer at our research facility in Oxkutzcab, Yucatan we are attempting to learn more about this unique deposit and what it might indicate about the people of Stairway to Heaven and the process of abandonment over a millennium ago. Presently, we are two weeks into the 2015 field season and while other BRAP projects are underway we are in the lab analyzing every piece of material recovered from the chultun excavations. So far we have made one important discovery – at least some of the vessels we have found in the chultun were deposited as complete (Figure 3). They weren’t garbage but complete pots, intentionally placed and left in the empty cistern. Over the next month we will provide updates as we continue to explore this amazing archaeological find at Stairway to Heaven. This is the first post in a series by George Bey. Find the next post here.